It's a quick read, but if you're a Potter fan, this is worth every penny. It gives extra details not found in the books and should put a smile on the face of true fans of the series. To say that I was a Harry Potter naysayer when the 5th book came out was an understatement. 1 weekend I was off and my daughter was at her father's so I had nothing to do. I worked at our local library at the time, so I thought what the neck, I'll see what all the fuss is about. From the very first page I was hooked! I get it! So every chance I get to dive into the world of Harry Potter, I take it and am never disappointed! Hi. This is my first review so forgive me if it may be uncomfortable for your palette. 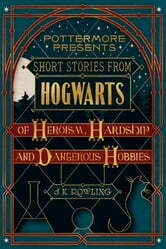 As my review's title imply, I see a nostalgic air when J.K. Rowling made this book. It benefits to give a brief post HP series dose of hangover and an avenue to give justice to some important characters that shaped the life of Harry and his friends. Taken at a crossroad, these stories is in fact fictitious; but, there is much wisdom reflective of our contemporary times that J.K. Rowling strategically points out. It may be mere fantasy to the kids and kids at heart but its lessons must be extracted, understood and relished.